With a little TLC and a handful of pantry items, you can keep your shower clean—and relax a little more during your next morning routine at the sight of mold-free tile. There’s no such thing as a truly refreshing bathing experience in a shower that looks—or even feels—dirty. To keep the tub, tile, grout, liner or door impeccably clean, laborious scrubbing is rarely necessary. You can normally get by just fine with light cleaning, so long as you stay consistent: Apply homemade shower cleaner after each use. Homemade shower cleaner costs almost nothing to make and involves only a few simple ingredients you probably have on hand in your pantry. That said, no matter how dutifully you clean the shower, there are occasions that call for deeper cleaning. We have recipes to help you handle that, too. Diluted vinegar: It’s cheap, readily available, non-toxic and a wonderfully effective as an everyday cleaner. Fill a spray bottle with equal parts vinegar and water, and you should have enough to last at least a couple of weeks. Spray down the shower after each time you use it, and the homemade shower cleaner will combat odors and prevent the growth of bacteria and the buildup of grime. If you’re not fond of vinegar’s smell, add in a few drops of lemon oil to impart a citrus scent. Even if you consistently use the homemade shower cleaner explained above, chances are that perhaps twice a month, you’ll want to go a step further to make your shower sparkle. On those occasions, mix one or two cups of baking soda with a few drops of liquid dish soap. Here, the baking soda acts as an abrasive agent to dislodge stubborn residue, while the soap breaks down grease and oils. Use a brush or sponge to apply this cleanser, and run the shower to wash it away. 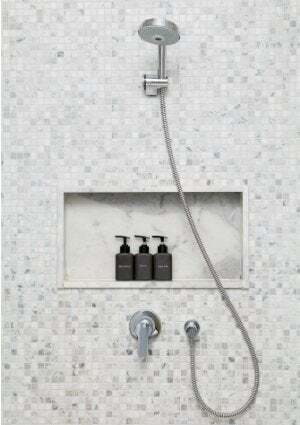 With all its moisture, cracks, and crevices, the shower is a natural and notorious breeding ground for mold and mildew. If you get behind on your cleaning regimen and things start looking a bit scuzzy, restoring cleanliness may require some more firepower. In a spray bottle, combine 1/3 cup ammonia, 1/4 cup white vinegar, 1/2 cup baking soda, and 7 cups of water. Spray down the shower, then watch as the vinegar and baking soda together create a cleansing, bubbling foam. 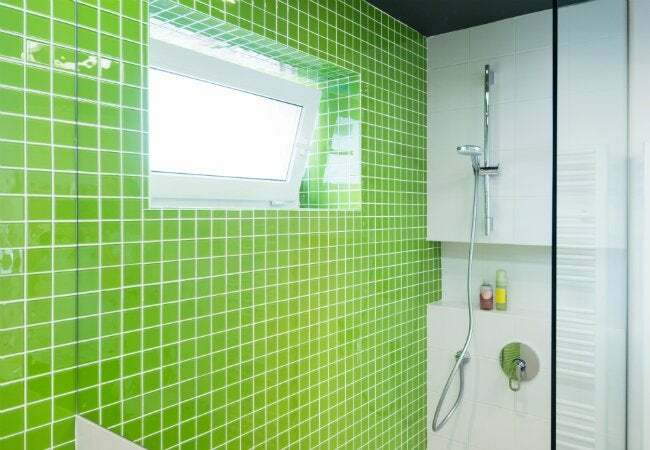 Let it sit for a few minutes, then wipe down the tiles and tub with a damp cloth. Again, run the shower to wash away the cleaner. Take a two-stage approach to clean shower doors. First, mix baking soda and water into a thick paste, then use a sponge to apply that paste to the glass. After rinsing that away, spray on a mixture of equal parts water and vinegar. Finishing by wiping down the glass with a soft cloth that won’t leave streaks.